Salamanca is the capital city of the province of Salamanca in the autonomous community of Castile and Leon. It is situated about 200 kms west of Madrid and 80 kms east of the Portuguese border, on the banks of the Tormes river. The city is famous for its monuments and rich artistic heritage, as well as for its university. Salamanca was named the European City of Culture in 2002, and the old city of Salamanca was declared a UNESCO World Heritage Site in 1988. The University of Salamanca, founded in 1218, is the oldest university in Spain and fourth oldest university in the western world. The university has earned a highly prestigious reputation and, today, it is a magnet for foreign language students learning Spanish. Salamanca was named the European City of Culture in 2002, and the old city of Salamanca was declared a UNESCO World Heritage Site in 1988. The baroque style town square in the city center where the Town Hall is located. It was built by Andrés García de Quiñones at the beginning of the 18th century and was originally used as a bullfighting arena. Currently, it is used mainly for music concerts and the Central Market of Salamanca is held next to it. It is considered to be the finest town square in the country. This Romanesque Cathedral was founded in the 12th century. The vault of its apse was frescoed by the early Renaissance painter Nicolas Florentino. This "new" Cathedral was built alongside the "old" Cathedral in stages from 1509 onwards and it combines late gothic architecture with a Renaissance style called Plateresque. Construction wasn't completed until 1734. There is a bronze crucifix stored in the Cathedral's treasury that was carried into battle before El Cid. An unusual 13th Century building with Gothic style architecture and a facade that is covered in seashells. A beautiful 16th century palace located near Plaza Mayor, with intricate mouldings and stone carvings. Another well-preserved 16th century palace, located in Salamanca city center. This center is a popular concert venue and also hosts a number of festivals throughout the year. There are also a wide variety of museums and art galleries in Salamanca with exhibitions that will cater to every taste. These include the San Esteban Museum (situated in the historic Convento de San Esteban with religious exhibitions), the Art Nouveau and Art Deco Museum, The International Centre of Art (with many temporary exhibitions and works by Picasso), The Castile and Leon Film Library (exhibiting movie memorabilia and information about the film industry), The Museum of Fine Arts and the Museum of the City's History (detailing the history and heritage of Salamanca and the surrounding area). Salamanca is known for the quality of its agricultural products. Popular products in the area include many different types of sausages and Spanish ham ("Jamon Serrano"), cheeses and specialities like the "Alberca" beans and almonds from Alba de Tormes. Food served in Salamanca varies greatly between the seasons. During the winter, which is particularly cold, popular dishes include chicken and pork stew, stewed meatballs and "Morucha" beefsteak (a special breaded calf from the Huerga area). 'Tapas' are common fare in summer. Other typical Salamancan dishes include "Hornazo" (a salty pastry made with ham, sausage, bacon and egg), "Chanfaina" (rice prepared with sausage and other pork) and "Farinato" (cured pork sausage traditionally served with fried eggs). The annual carnaval is celebrated on the 3rd and 4th weekend in February and it includes events like parades and costume parties. There is also 'bull-running´in the village of Ciudad Rodrigo near Salamanca. A celebration of St. John of Sahagun, the patron saint of Salamanca. Celebrations take place over 4 days starting on 12th June. This used to be a religious event celebrated with processions, but it is now also celebrated with bullfighting events and other festivities. It takes place on the 25th July. The town festival in Salamanca starts on the 8th September as a religious event celebrating the saint Virgen de la Vega with pilgrimage marches to Pea de Francia Shrine outside the city. The event is then celebrated with a huge festival, which lasts until the 21st Spetember. The city was originally founded by the Vacceos (a Celtic tribe) in the pre-Ancient Roman period, and later besieged by Hannibal. Later the province was inhabited by the Greeks and Carthaginians who were the first to built a small settlement where the city now exists. Later, when the Romans occupied the Iberian Peninsula (from 218 BC), the province of Salamanca became an important agricultural area and commercial hub. Salamanca was later conquered by the Visigoths and then the Moors in 712 AD. Then, in the beginning of the 12th century, it was recuperated by the Christians. 1218 was one of the most important years in Salamanca's history as Alfonso IX of León created the University of Salamanca and declared the city a university town. During the following centuries Salamanca grew in size and experienced a relatively peaceful period. 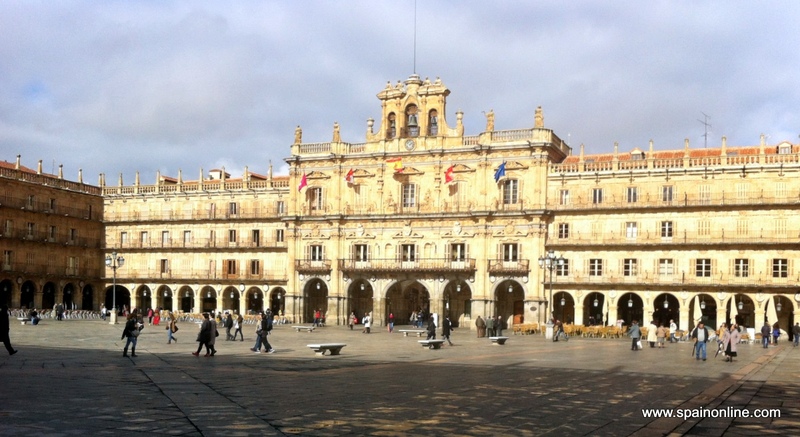 Nowadays Salamanca is a popular tourist destination and university town with a huge student population. It is also an incredibly modern city hosting a variety of international events.